Wacom Cintiq 13HD Creative Pen Display. Gain all the innovations of our professional pen tablets, now with the ability to work directly on the screen of this compact Cintiq 13HD. Great color and resolution, professional ergonomics, and pressure-sensitive control are all together in an affordable design. Work the way you want. Adjustable, detachable stand offers four ergonomic positions, including three different working angles. Compact, slim design takes up minimal desk space. A convenient USB port lets you easily transfer photos and access files. Equally as comfortable to use whether youre right or left-handed. High-resolution 1920 x 1080 LED display with a 178º viewing angle and 16.7 million colors. Four customizable ExpressKeys, Rocker Ring, and Home Button for easy shortcut access. Complete with the powerful Pro Pen. With a new, ergonomic design, the Pro Pen provides a more comfortable feel than ever. You can also count on precise control, thanks to Wacom's 2048 levels of pressure sensitivity and tilt recognition. The pen responds to the slightest nuance of your touch, as you press the pen against the tablet surface, for complete control of brush width and opacity. Take your Pro Pen with you, quickly. The compact Pro Pen carrying case includes storage for extra nibs and color rings, which help you easily distinguish between multiple pens. The Pro Pen works across all recent Cintiq pen displays and Intuos Pro pen tablets. Work easier and faster, thanks to four customizable ExpressKeys, Rocker Ring, and Home Button, which provide one-touch access to your timesaving shortcuts. Cintiq 13HD will work your way. Simple setup to any computer. The convenient, new 3-in-1 cable reduces cable clutter and makes setup to any Mac or PC a snap. The high-definition 13 display offers an ample active area, yet it takes up minimal desktop space. All Cintiqs are compatible with both Mac and PC. Dozens of creative software applications benefit from Wacom pen recognition and pressure sensitivity. Expand the creative capabilities of your Cintiq with an array of compatible pens, grips and pen tips. Artfully yours Saving time without sacrificing precision, control, and artistic integrity. This is what drives illustrators and fine artists to Wacom. Your creative software is already optimized with built-in pressure-sensitive features, so you can sketch, draw, paint, and composite with natural and intuitive precision. Streamline your graphic design workflow To meet tight deadlines and client expectations, graphic designers turn to Wacom creative pen tablets and pen displays for a more natural and intuitive creative experience, allowing them to create and collaborate faster. 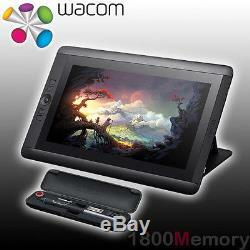 Wacom Cintiq 13HD Technical Specifications. LCD Screen Size : 13.3 (338mm). Native Resolution : 1920 x 1080. Pen and Erasure Pressure Levels : 2048. Tablet Dimensions : 375 x 248 x 14 mm (14.75 x 9.75 x 0.5 in). Stand Adjustability : 3 angles and detachable. Connections : - HDMI and USB, - USB 2.0 Port. 8, 7 (32 / 64 bit), Vista SP1, XP SP2 - Mac OSX v10.6.8+. Cintiq 13HD interactive pen display. Pro Pen, pen box with 9 replacement nibs and nib removal tool, pen stand. Wacom 3-in-1 cable with HDMI and USB connectors. The item "Wacom Cintiq 13HD Creative Pen Display 13 Graphics Tablet DTK-1301 1920x1080" is in sale since Sunday, April 28, 2013. This item is in the category "Computers/Tablets & Networking\Keyboards, Mice & Pointers\Graphics Tablets/Boards & Pens". The seller is "1800memory" and is located in New South Wales. This item can be shipped worldwide.